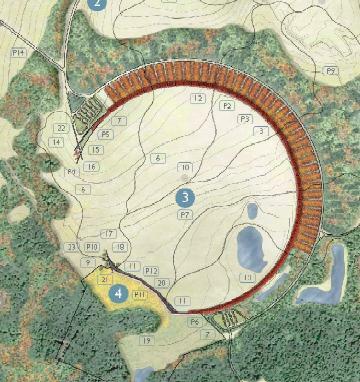 Paul Murdoch's design is perfect for the Flight 93 memorial, that American ground where 40 heroes fell. I've been following the controversy over the selection of Crescent of Embrace to be the basis for the permanent Flight 93 memorial just north of Shanksville, PA, and just listened to an interview of Sandy Dahl, a 9/11 family member, that was about this controversy [to listen use the link to KHOW's Caplis and Silverman get a dissenting view from a Flight 93 family member]. She served as a member of the Flight 93 Task Force. My wife's brother was one of 343 9/11 firefighters, I lost a friend in the Pentagon that same day, and Patty (my wife) and I live 50 miles north of Shanksville. I'm retired Army. In America you'll find no one filled with more rage towards Islamic terrorists than me. If you want to see how strongly I oppose those who would dishonor the memories of those murdered on 9/11, take a look around this website and you’ll see that I stand with www.takebackthememorial.org and the many family members who oppose an International Freedom Center being placed on the World Trade Center's hallowed ground. Yet I am sane and any and everything that could possibly symbolize the 9/11 attacks upon our nation doesn't set me off on a tangent. I have great respect for the bloggers now speaking out against the Crescent of Embrace yet I also note they are doing or are ignoring exactly what many of them decried during last year's Rathergate document doctoring scandal. Someone on the internet has obviously taken the actual Crescent of Embrace graphics [requires a pdf reader] and flipped and angled them so instead of the opening of the crescent facing southwest in alignment with the bowl and towards the sacred ground where Flight 93 crashed they've depicted the crescent as facing east toward Mecca. That person even created a graphic index file of the reddish-brown groves of trees that edge the crescent and has them transfiguring to bright red which I suppose is to symbolize Islam and thus be offensive. Could Paul Murdoch change the design and put an end to this controversy? Perhaps. If he does, will the bloggers take a fresh, objective look at his design? I hope so and I also hope that we don't let Islamic terrorists dictate every word in English we decide to keep or toss out. I ask my friends in the blogging community to take a few deep breaths as the memorial selection process continues. I think most folks will support what the selection committee finally decides upon for the Flight 93 memorial. Will everyone approve of it? No yet the Flight 93 memorial will never be desecrated by those creating it. What could happen is a group of otherwise intelligent internet bloggers will inadvertently and unfairly diminish the reputations of the good people creating the Flight 93 memorial. Patty and I have come to know many of the people of Shanksville and the surrounding area, to include the first responders to the crash site and the locals who are involved in both the temporary memorial and the permanent memorial's selection process. On July 4, 2002, we marched, as a living flag, with a couple hundred folks in Shanksville's July 4th parade. With a population of only 243, Shankville needed help from 5 states and the surrounding communities to have enough people to make that happen. Thankfully, Shanksville resident Donna Glessner has the moxie to put that together. She also heads the 40 volunteers, known as Ambassadores, who act as tour guides at the Flight 93 memorial site and serves as the vice-chair on the Flight 93 memorial advisory committee. Donna is one example of the fine people who live there and who are dedicated to preserving the memories of 40 heroes and to creating a fitting memorial for them. Well enough do I know the people there that I can say no where else in America could they have come down to a community better suited to care for their memories. These people aren't financially rich yet they are rich in character. 8 of the 15 jury members of the phase II selection process were 9/11 family members [pdf] unlike the one token and already in the fold 9/11 family member among the cultural elites that chose the memorial for the World Trade Center. Those 8 jurors, as members of the 3,000 families, suffered the brunt of the 9/11 attacks on our nation and yet now they are taking heat for something they did not do and would never do. We've visited the Flight 93 temporary memorial often. When I saw the five finalists, Crescent of Embrace was my first choice. I actually read all the pages and saw that the red was the turning leaves of sugar and red maple trees in fall and that those 40 groves would be planted in memory of each of 40 heroes of Flight 93. I also know those tree will be green for most of the year and devoid of leaves in the winter as is fitting for that area. The design, in my opinion, is the best design and will become a fitting memorial. I see the crescent moon once a month as only a moon. I don't think we need a Constitutional Amendment to prevent people from calling New Orleans the Crescent City. I wear a red tie occasionally and the first person who tries to rip one off me because they perceive it to symbolize my alleged support of Islamic terrorists might want to first check to see if their health insurance coverage is up to date. Crescent is a word in the English language and I don't know or care to know its equivalent in Arabic. Had the memorial's designer called it Crescent of Embrace using the Arabic words that probably would explain the latest controversy yet the designer didn't use and the memorial jury didn't interject an Arab name for his design. Paul Murdoch's design is perfect for that American ground where 40 heroes fell. I recommend they change its name yet keep the design itself. Mr. Murdoch has already offered to change its name. The red and sugar maple trees that surround the crash site and will be planted on it will turn reddish each year. The natural bowl with the sacred ground at its southwest corner forms a near-perfect circle yet the circle itself was broken by terrorists and those who bravely thwarted their attack. What remains looks like a crescent. The 9/11 family members involved and the good people of Shanksville and the surrounding area will ensure that ground is not desecrated and those 40 heroes are not dishonored. I know that. I hope that internet bloggers will not unfairly harm the good people involved by turning one English word into a battle cry and by continuing to use a distortion of the truth to smear the people involved. Let us all take a few deep breaths and watch the Flight 93 memorial project develop. I, for one, support it and will donate towards it as it is currently designed.